VIEWS, VIEWS, VIEWS!! Executive style over-sized condo, 2 Bed / 2 Bath + DEN. This unit is located in the South East corner of the UPPER BUILDING & overlooks downtown. 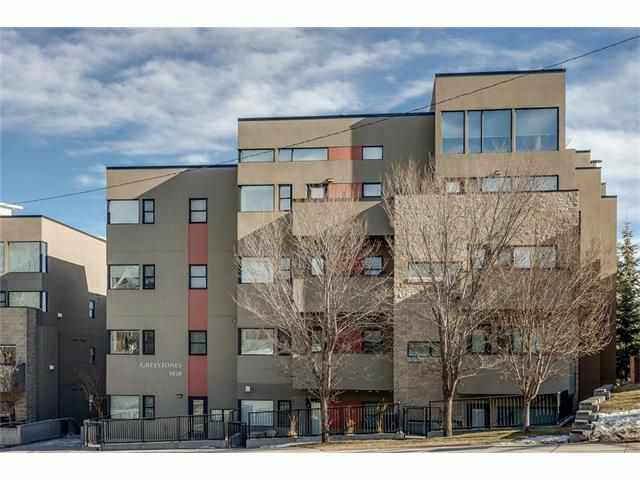 Very urban apartment-style condo with open concept floor plan, large windows & 9' ceilings. The kitchen features wood cabinets, GRANITE counters throughout, GAS range, breakfast bar & STAINLESS appliances. The living room has a Gas Fireplace with modern concrete surround. This property is pet friendly, HEATED tiled flrs make for a very durable & contemporary space. The Master includes a large WALK-IN CLOSET & 5 pc En-suite with SOAKER tub & 2 sinks. The 2nd bedroom & bath are down the hall, very separate for a room mate, child or guests. This unit includes a full sized PRIVATE OFFICE with door, spacious foyer with lg closet, IN-SUITE LAUNDRY, ELEVATOR, underground heated TITLED PARKING & VISITOR parking, 8'x 8' STORAGE cage, BALCONY & walk-able distance to all the pubs & restaurants of 17th Ave. Low Condo Fees / sq.ft.